Ada Lovelace is considered the world's first computer programmer. The only legitimate child of the mercurial Lord Byron, her mother raised her to be rational and disciplined. Ada was a willful child and an early mathematics prodigy. As a young adult she gravitated to intellectual circles and began working with Charles Babbage on his prototype of a number calculating machine. She quickly understood the magnitude of this invention more than he, and began assisting in its development. Even as her improvements to the calculating machine continued, her failing health along with the patronizing view of women meant that her contributions to the study of mathematics were buried for centuries. Chiaverini once again ably shines a light on a little known but accomplished woman. 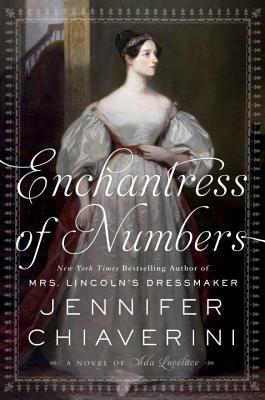 New York Times bestselling author Jennifer Chiaverini illuminates the life of Ada Byron King, Countess of Lovelace—Lord Byron’s daughter and the world’s first computer programmer. The only legitimate child of Lord Byron, the most brilliant, revered, and scandalous of the Romantic poets, Ada was destined for fame long before her birth. But her mathematician mother, estranged from Ada's infamous and destructively passionate father, is determined to save her only child from her perilous Byron heritage. Banishing fairy tales and make-believe from the nursery, Ada’s mother provides her daughter with a rigorous education grounded in mathematics and science. Any troubling spark of imagination—or worse yet, passion or poetry—is promptly extinguished. Or so her mother believes. Jennifer Chiaverini is the New York Times bestselling author of Mrs. Lincoln's Dressmaker, Fates and Traitors, and other acclaimed works of historical fiction, as well as the beloved Elm Creek Quilts series. She lives with her husband and two sons in Madison, Wisconsin.